Szeryng, Henryk, celebrated Polish-born Mexican violinist and pedagogue; b. Zelazowa Wola, Sept. 22, 1918; d. Kassel, March 3, 1988. He commenced piano and harmony training with his mother when he was 5, and at age 7 turned to the violin, receiving instruction from Maurice Frenkel; after further studies with Flesch in Berlin (1929-32), he went to Paris to continue his training with Thibaud at the Conservatory, graduating with a premier prix in 1937. On Jan. 6, 1933, he made his formal debut as soloist in the Brahms Concerto with the Warsaw Philharmonic With the outbreak of World War II in 1939, he became official translator of the Polish prime minister Wladyslaw Sikorski's government-in-exile in London; later was made personal government liaison officer. In 1941 he accompanied the prime minister to Latin America to find a home for some 4,000 Polish refugees; the refugees were taken in by Mexico, and Szeryng, in gratitude, settled there himself, becoming a naturalized citizen in 1946. Throughout World War II, he appeared in some 300 concerts for the Allies. After the war, he pursued a brilliant international career; was also active as a teacher. In 1970 he was made Mexico's special adviser to UNESCO in Paris. He celebrated the 50th anniversary of his debut with a grand tour of Europe and the U.S. in 1983. 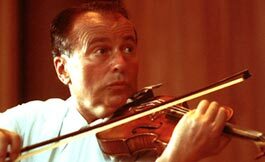 A cosmopolitan fluent in 7 languages, a humanitarian, and a violinist of extraordinary gifts, Szeryng became renowned as a musician's musician by combining a virtuoso technique with a probing discernment of the highest order. Source: "Henryk Szeryng." BAKER'S BIOGRAPHICAL DICTIONARY OF MUSICIANS®, Centennial Edition. Nicolas Slonimsky, Editor Emeritus. Schirmer, 2001. Reprinted by permission of The Gale Group. Photo: Courtesy of the Annenberg Rare Book & Manuscript Library, University of Pennsylvania. Used by permission.